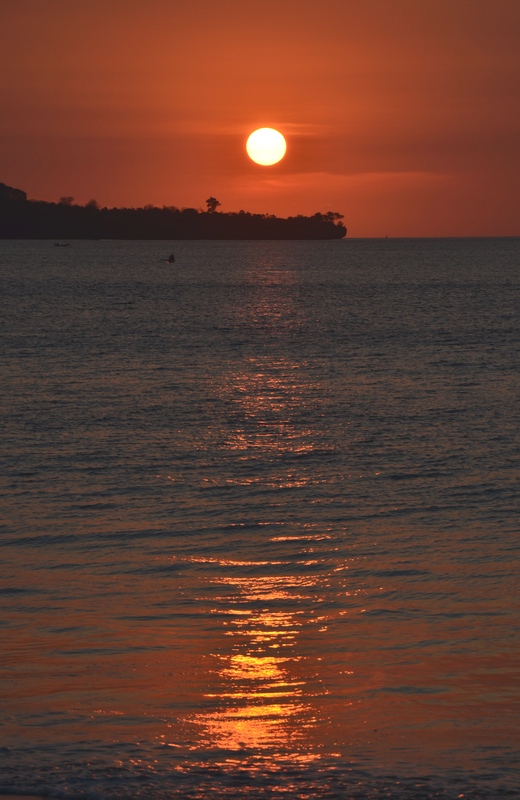 Photos of a Beautiful Sunset in Jimbaran Bay, Bali – Why Waste Annual Leave? Since becoming cocooned in the travel blogosphere, I’ve spied on the pages of my fellow travel bloggers with a zealous curiosity. Sometimes I read about lands I myself have memories of; sometimes an insatiable wanderlust arises when I read of countries I yearn to visit. Every so often, I come across a bucket list and this is where I differ. I myself have never had a list like this. Until I started blogging, I’m not even certain I’d heard the term. So, whilst there are no tick boxes from my end, there are a few feats of nature that I have dreamt of seeing – an agile snow leopard, a discernible rainbow, a perfect, beautiful sunset. Number 1, I accept, is highly unlikely but numbers 2 and 3, I have held out hope for. In Jimbaran Bay Bali last year, I came face to face with the third. The pursuit of sunset-seeking is rather reminiscent of that of finding love. Mostly, a sunset will enter your life with a charm, perhaps an acute infatuation but an imperfect one at that. The borders may need clarity, needing effort and perseverance through cloudy filters but gripping your heart with a passion once it finally comes into fruition, your rewards reaped. And occasionally, if you’re one of the lucky ones, it comes your way at first sight unexpectedly, lighting up your world quite literally in all its glory and absorbing you with such ferocity that you feel blessed to have known it. 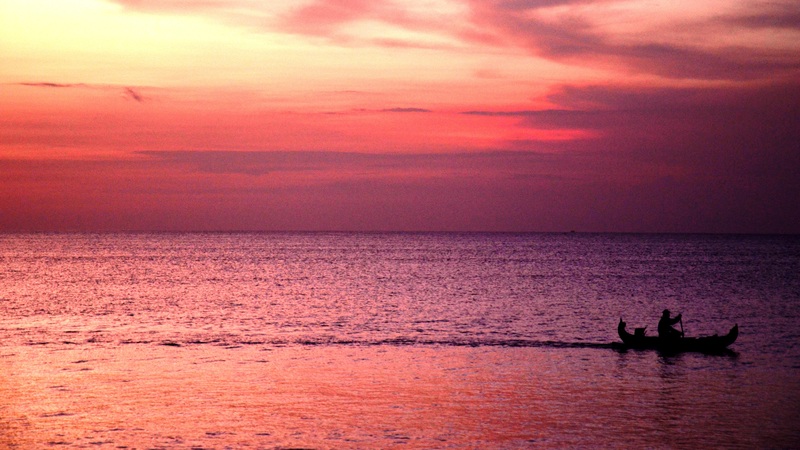 After flirtations with the other sunsets of the world, it was love at first sight for me in Jimbaran Bay, Bali. 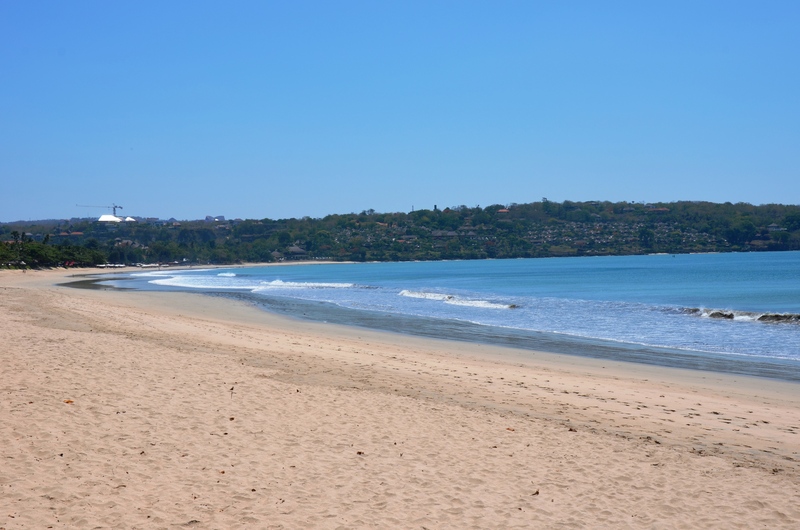 As the quieter stretch of silky soft sand in southern Bali, away from the more built up resorts of Nusa Dua, the beach at Jimbaran Bay is as much for the locals as it is for the eager tourist and when we strolled down from the Kayumanis Resort, we had no doubts we had chosen the right coastal area for our two night post-Ubud break. In the evenings, Jimbaran Bay is the antithesis of Kuta chaos. A metaphorical gate opens, allowing you to watch the beautiful sunset glow evolving through cycles of crimson, golden and mandarin whilst fresh seafood cooks slowly on barbeques of heated coconut shells. Just make sure you take your seat nice and early as you won’t be the only ones sharp enough to be camping out at one of the many numerous seaside cafes and the seafood cooks to perfection at a sleepy pace. And if your stomach can’t hold out, perhaps a dose of fresh corn on the cob from a beach stall will tide you over. 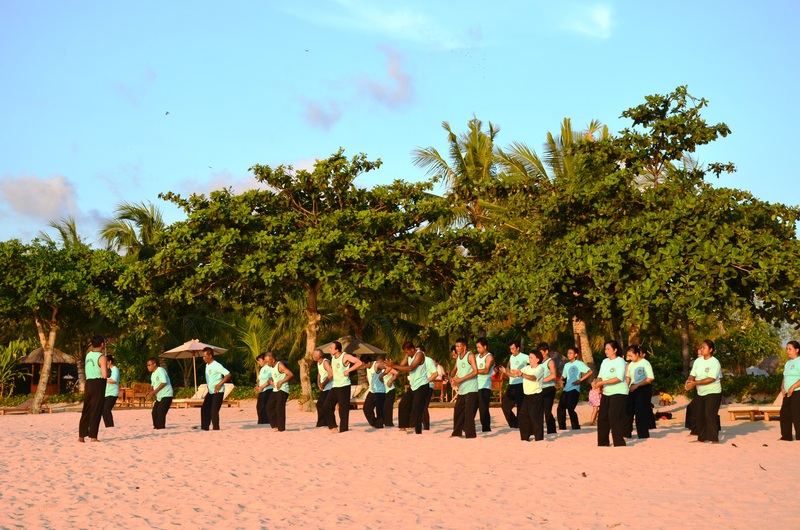 You may even spot a late afternoon live Tai Chi class on the beach and what better place to do it? 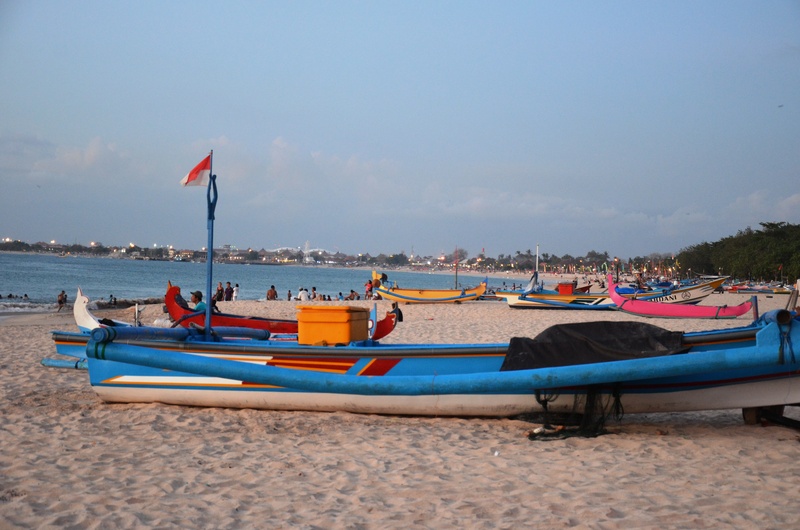 The beaches of Bali get rather mixed press but when the sand coats your feet in Jimbaran Bay, you’ll wonder why. At sunset, the volume steps down a notch whilst all visitors pause to absorb its magic and the only sounds are those of the waves singing a cathartic hum and locals having banter with one another, immune to its beauty. Looking around, I knew I had been right to save myself for the renowned Balinese sunsets. I lifted my camera to frame the enchanting moment and as I looked up, it seemed I wasn’t the only one. Thank you Emma, it was worth the wait! Oh my gosh, those photos are incredible! I need to go to Bali!! The sunsets in Hawaii are stunning — I’ve never seen anything like them! That’s a lovely idea Ayla, I think I might just do that – our walls could do with a splash of colour and the sunsets here were definitely full of that! 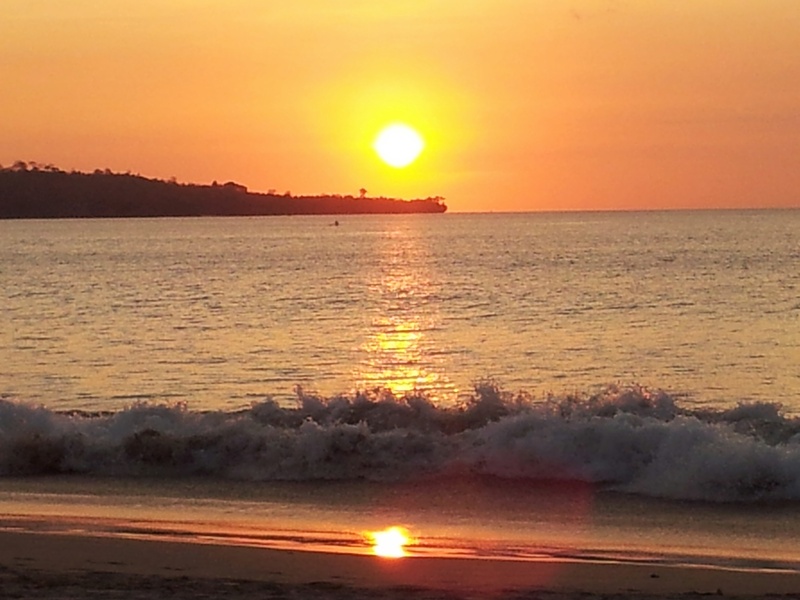 Gorgeous, I can never resist a good sunset – saw some of the best ever in Bali too. Thank you lovely! It’s not so hard when the views are so gorgeous ☺ Does make me miss being in Bali – it was one of my most loved destinations! So pretty and I like the comparison to finding love! Wow, it’s so breath-taking and romantic! Thank you Agness, it really was breathtaking! 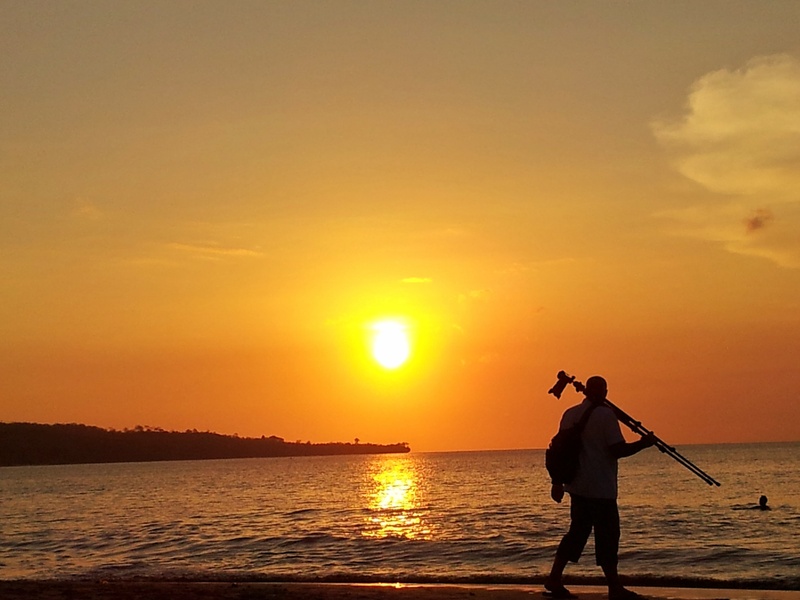 You must have seen some great sunsets during your time in Bali too right? Haha, I didn’t actually this time as they were all wearing the same T shirts so I didn’t want to gatecrash their tail chi party but I quite enjoyedit the only one time I’ve tried it in the past! Wow, that sunset is amazing! Such a kind comment Katie – really put a smile on my face ☺ I think the snow leopard is virtually a guaranteed no so it’s nice to have a few things you dream of seeing that are a bit more achievable like a great sunset! i cant resist a good sunset pic! and here are many! Aww thank you Mehreen ☺ I’m so often all about seeing new places but Bali is definitely somewhere I would love to return to one day! An agile snow leopard! Wouldn’t that be a sight to see? But the Bali sunsets you took in look like good consolation prizes :-). Haha, they were gorgeous but yes, as far as the snow leopard goes, I think the closest I’ll be getting is a wildlife documentary! Ohhh it looks beautiful! Can’t beat a good sunset – and with fresh fish and corn on the cob to snack on too, what more could you want?! I can imagine! I really want to visit both those countries and will set my alarm extra early when I do! Pingback: A Slice of Seychelles Luxury at Constance Lemuria Resort, Praslin | Why Waste Annual Leave? Pingback: Monkey Mayhem at Sacred Monkey Forest Ubud, Bali | Why Waste Annual Leave? Pingback: Travel Tips for Santorini | Why Waste Annual Leave? Pingback: A Relaxing Retreat at Elysium Hotel & Spa, Cyprus – Why Waste Annual Leave?